Chicago's gun violence and racial tensions within its black and Latino communities attracted the national spotlight in 2016. Addressing the root causes of these problems will require a nuanced approach—and considerable investments of time and money. Now, one local organization is in the national spotlight for being part of the solution. Sheldon Smith, founder of the Dovetail Project, was recently honored as a finalist on the TV special CNN Heroes, which recognizes individuals who make exemplary humanitarian contributions. Since its founding in 2009, the Bronzeville-based Dovetail Project has worked with African-American fathers ages 17 to 24 to build skills and offer the support they need to be better fathers for their children and to positively contribute to their communities. Smith, 28, launched the organization out of a desire to help break what he sees as a cycle of fatherlessness—an issue that deeply affected him as he came of age. "I grew up with a father in and out of my life, and it hurt me for a lot of years," Smith said in a recent interview. He grew up frustrated with the situation, along with the lack of resources and opportunities around him. "I do this work," he said, "because of the change I've been able to see in a lot of the young men and women we serve." At 17, Smith was incarcerated for his role in a felony robbery. Upon his release from prison, he committed to changing his life. 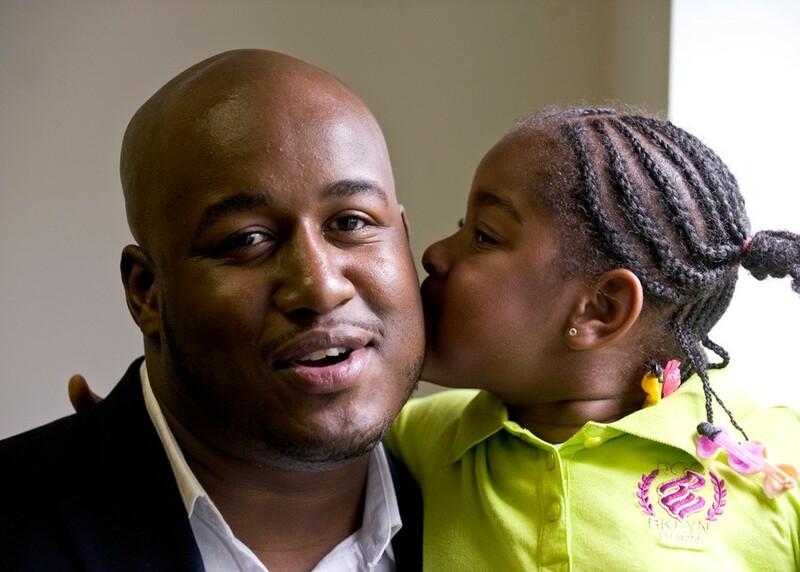 He completed high school and community college, found employment, and became a father at age 20. After doing some research into issues of fatherhood and taking his own experiences into account, Smith created the Dovetail Project's curriculum. The 12-week program breaks up into three modules: lessons in felony street law, to educate program participants about how they can avoid conflicts with police and subsequent incarceration and stay present in their children's lives; life skills training, to help students finish their education and seek employment; and a course in basic parenting. Breakout sessions tackle touchy subjects such as what it means to be a man, successful coparenting, and how participants have been affected by their relationships with their own fathers. "They may say, 'Mom taught me how to be a man,' or 'The streets taught me how to be a man,'" Smith says. "Rarely do you hear them say, 'My father taught me how to be a man.'" Most black children grow up in single-parent households, Smith notes, with various social factors taking parents out of their kids' lives. "They're looking for support," he says of struggling parents. "That's the untold story." Participants must complete Dovetail's program without missing more than two class meetings. After completion, the group holds a formal cap-and-gown graduation ceremony to mark everyone's progress and give families and program supporters a chance to celebrate. On the heels of the CNN Heroes tribute, the Dovetail Project held its 14th graduation December 15. Over a six-year period, all of the program's 245 graduates have gone on to either finish their education or transition into a new job, Smith says. The Dovetail Project recruits in the community—on street corners, at CTA stops, and even going door to door. Potential students can also apply online. The program is offered twice each year, in the spring and in the fall, with recruitment taking place between sessions. Although the curriculum is currently geared toward young black fathers, Smith says he hopes to expand and adapt the program to serve young Hispanic fathers within the next three years. Smith says he believes the program's success comes in part from an approach that meets students where they're at and works with them, rather than talking down to them and assuming what their issues may be because of their backgrounds. He stays in regular touch with the program's graduates, and says a community has formed among the alums. In seeing their success, and reflecting upon how far he's come personally, he believes that it's possible for other young black men to follow suit. "My father was in and out of my life," he says. "I maybe cried about it until I was 23 or 24. But I was able to overcome it, be a great father to my daughter, and stay focused on what I needed to do to move the organization forward." Smith has since reconnected with his own father.